Later this month, Firehouse Theatre will combine burlesque, Dolores Umbridge, sideshow acts, Jeffrey Dahmer, and improv games to bring fans and those with a passion for the weird and unusual with their latest production, Villains of Vaudeville by River City Vaudeville. Ray Bullock, Founder of River City Vaudeville, wishes to bring back the old style of vaudeville and promote artists and styles of performance that may seem underground in the Richmond community. Mixing stand-up comedy, singing, burlesque, improv, and sideshow performance, vaudeville is the multi-faceted performance art of the 19th century. And while many associate vaudevilles with a naughty aspect due to the burlesque, Bullock said that vaudeville is a dying art that needed something to bring it to audiences’ attention again. Bullock, a Richmond native, has been involved in the performance scene for the last 22 years, beginning with standup comedy. After running the 9:55 Club, and having several friends who were involved with circus art, comedy, and more, Bullock realized he wanted to show Richmond the alternative performance art forms that were not so common. Thus, River City Vaudeville, with its first official season, hit the Richmond theatre scene. But how do villains play a role in vaudeville? With The Devil himself hosting and Dolores Umbridge and Doctor Horrible acting as stagehands (or “chaos control”), audiences can expect a variety of well-known characters doing uncharacteristic acts. Maleficent and Norman Bates will both be doing musical numbers. Audiences can expect to see The Joker doing standup comedy. Catch Elizabeth Bathory doing burlesque. Jeffrey Dahmer, Charles Manson, Ted Bundy, and David Berkowitz all perform improv games. And while many audiences might find these acts lack in taste, Bullock wished to reassure audiences that they’re meant to be cheeky. “The way I look at it, if you’re going to use people [who] did the most horrific, deplorable, awful things known to man, they deserve to be made fun of,” he said. The irony of evil characters, both real and fictional, hosting an entire evening of comedy and performance is not lost in translation. The performance itself won’t be the only spectacle. House music will be provided by Glitterally Can’t Even, a Ke$ha pop-punk cover band. A raffle to support the actors will include several prizes, including the grand prize of a Joker print signed by Mark Hamill. It is without saying that an audience member of any fan-base will find their niche at this event. 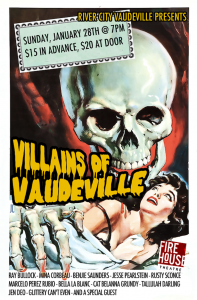 You can catch Villains of Vaudeville Jan. 28 at 7 pm at Firehouse Theatre. $15 in advance, $20 at the door. Ticket information can be found here. Get ready to fall down the rabbit hole and once again return to Wonderland, but this time with a much more mature, different kind of Alice. 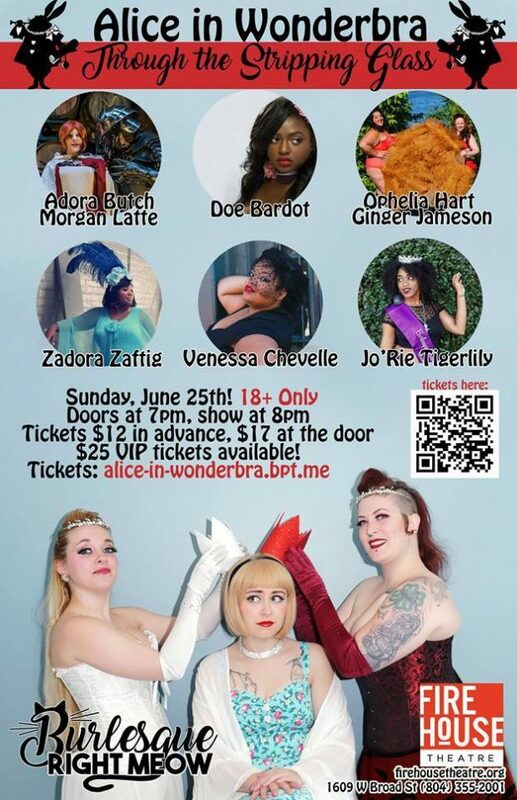 This Sunday, Burlesque Right Meow will present Alice in Wonderbra: Through the Stripping Glass at the Firehouse Theatre for a night of whimsical fantasies and nonsensical allure. This time, Alice is an adult and has an equally curious adventure with a lot more glitter. Although the performers have not officially rehearsed together or specifically collaborated a storyline, each performer chose a character to represent from the Wonderland gang that will create a linked narrative. This show will feature 11 performers, including two duets and a trio act, who perform both locally and from out of town. Ophelia Hart, a queer woman of color who also goes by her stage name, is one of those out-of-town performers. Traveling from Washington, D.C., she and her dance partner Ginger Jameson will perform a number featuring some familiar characters. Characters such as the Cheshire Cat, the Caterpillar and a special trio performance from the producers of Burlesque Right Meow featuring Alice herself will all make an appearance. To see Alice in Wonderbra, head to 1609 W Broad at 8 p.m. this Sunday. Tickets are $12 in advance and $17 at the door. For more show information or to purchase tickets, visit the Firehouse Theatre website. Emma Claire is no stranger to facing fears head on and handling terrifying situations with grace and positivity. In a time when many of us watch the news in fear of the upcoming changes to our political landscape, one could argue holding on to some positivity and hope is of the utmost importance. That’s what makes Emma Claire so admirable. If you follow her on instagram, you’ll find photos of her glammed up and stage-ready for her burlesque performances. In others, you’ll find her beaming as she documented her final treatments for breast cancer. Having grown up in Richmond but ready for a new challenge, Claire relocated to New Orleans to pursue a job in vintage clothes reproduction. Naturally, she wanted to get all of her annual health check ups before making the move. That’s when her doctors found evidence of the cancer. Claire’s age held a lot of significance for her. On one hand, she was unusually young to have been diagnosed with breast cancer. “Everyone I knew that had cancer was old or very young when they had it,” she said. On the other hand, her age enabled her to stay on her parent’s insurance, for which all us young folk have Obamacare to thank. The conversations surrounding the repeal of the Affordable Care Act have instilled worry in much of the public, especially here in Richmond. Claire said she’s mostly concerned about a lack of replacement plan should the ACA be repealed. While the cancer wrecked havoc on her, Claire turned the worst of it into positive experience. She’s back doing burlesque after taking a hiatus, at the encouragement of her friends who are also performers. And after returning to Richmond from New Orleans, Claire found herself cultivating a supportive community of her own. She decided to be open about what she had been going through, not only by just telling the people around her but also by posting updates on her Instagram. She’s received incredible support from the online community. Posting on instagram was a way for her to remain body positive as well. Burlesque is known for celebrating all kinds of body types, and posting online and sharing her story was almost a natural step. Claire said it was therapeutic for her amidst all of the changes. “It was hard, doing burlesque again. But now I feel much more comfortable doing it. It’s helped me embrace my body again, which is more than I could ever ask for. I’ve had other survivors come to my show and say, I’ve had cancer too. You need to be able to re-embrace yourself. It’s fun being able to reach out to people through this artistic medium. That’s why I do it still,” said Claire. No matter who or how old you are, please make sure that you are giving yourself breast self-examinations at least once a month. If you don’t know how, you can learn here. You can check out Emma’s instagram and look out for future performances her. Quoth the raven, and be prepared for the mystery, because Edgar Allan Poe is coming back to life this weekend. Looks like the local news folks are fully embracing a slow summer news cycle and finding any and all facebook complaints worthy of turning into 2:45 second broadcast reports.